How to construct a square given only one side. Shown above is the line of any length that is also one side of a square. We want to construct that square. From point B swing 2 arcs of any distance and where they cross will create points C and B. Now we know that point B is the midpoint between points C and D. we also know that when we bisect a line, the bisector cuts the line on the mid point and at 90° as we requre to construct this square. So bisect this line and extend the bisector. Take the distance AB on your compass and swing from point B. 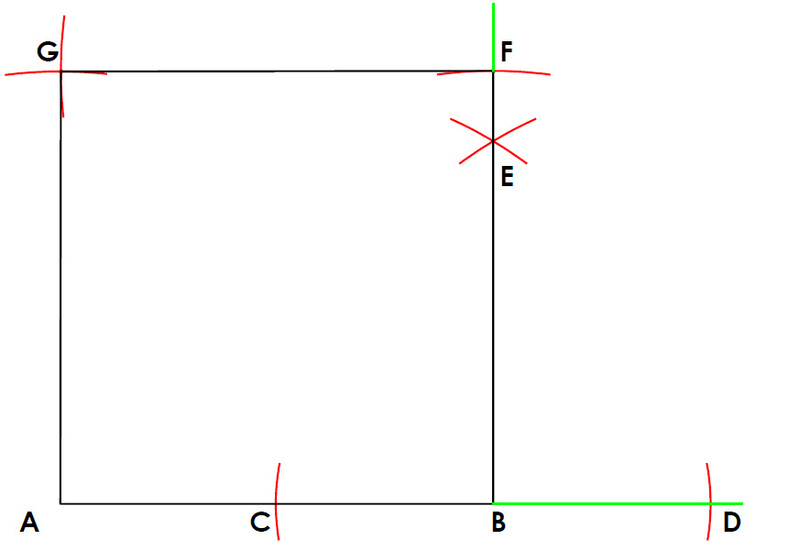 Where this cuts the bisector creates point F.
Now we have 2 sides of our square and 3 corners. since we know that a squares sides are all equal, we take our compass and set distance AB and swing from point A and point F.
Where these two arcs cross gives us our final point (point G) of our square. To finished we just join the points to create our square.